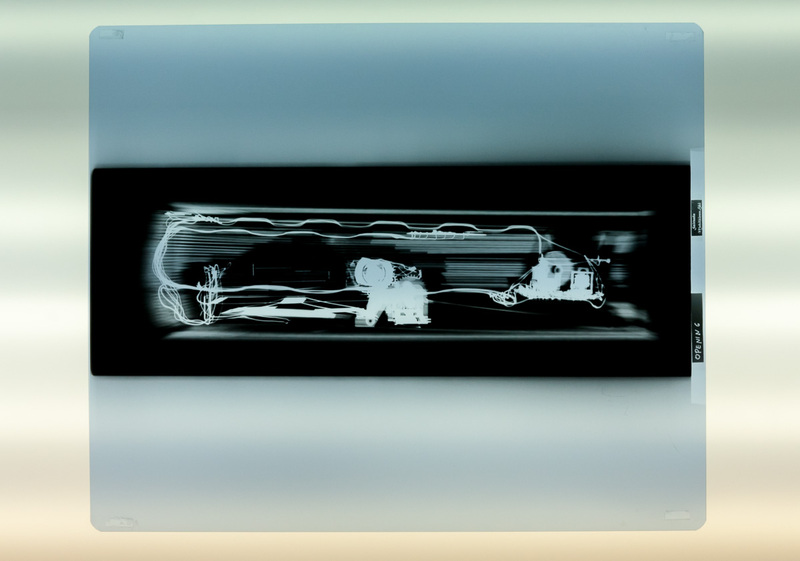 Axel Straschnoy 2008 3 x-rays on light-box X-rays: 43 x 35,5 cm. I have written before about the relationship (or the lack thereof) between the Finnish fine arts funding and exhibition system and the artworks produced within it2). What is particular about this system is that funding is available directly to artists, that most spaces are unable to support the production of the works they exhibit, and that most other spaces (galleries) charge artists a fee for exhibiting in them. Furthermore, there is no art market to speak of. As most galleries do not commission shows but select them through open calls, works are the results of the artist’s initiative. The artist looks for funding, looks for an exhibition space, produces the work, pays the fee, and exhibits his/her production. Most exhibitions are solo shows. This system has been justly criticized by, among others, Jussi Koitela in Mustekala3) . What interests me the most, however are the positive aspects of this system. In the same way that it restricts certain ways of working – which are common abroad – to prosper, there are certain things that only such a system allows. So, what artworks does the Finnish system enable that no other system does? In 1966, in Buenos Aires, Raúl Escari, Eduardo Costa, and Roberto Jacoby submitted pictures of a happening that had allegedly taken place (the Happening para un jabalí difunto – Happening for a Dead Boar) to a popular Argentinian magazine5). At the time, happenings were regularly reported in such magazines. News about this event was picked up and repeated by other media outlets. After a period of time, the artists informed the media that no such happening had actually taken place and that the photographs were staged. They then published the Primer manifiesto de arte de los medios (First Manifesto for a Mass Media Art) in which the role of mass media in creating reality was analyzed. Happening para un jabalí difunto demonstrated that an artwork exists not so much because it is exhibited but because it is mediated. The gallery is one of the mediating agents, but not the only one. A work of art does not exist because it is exhibited in a gallery. Rather, it exists because it is discussed, because it is documented, and because it is written about as art, in popular magazines or in art historical contexts. In the work of Federico Manuel Peralta Ramos (1939-1992) this premise is taken to its logical conclusion. Peralta Ramos developed the sixties ideal of merging art and life into a continuous practice, declaring himself “a living artwork.”6) As such, his work was not dependent on exhibitions–nor did he document it. Instead, it has passed to us mainly as narrations, both in the press and in an oral/mythical form. Gerard Genette defines the paratext as those parts of a book which, while not the text proper, frame and present the text: “[…]the paratext is what enables a text to become a book and to be offered as such to its readers and, more generally, to the public.”7) The paratext includes the title, the author’s name, the preface as well as interviews, articles, and notes in a diary. Both in Happening para un jabalí difunto as well as in Peralta Ramos’s work the paratext plays a central role in the construction of meaning. Art is understood as a discursive sphere where meaning is created by the mass media, art criticism, art history, catalogues, group exhibitions, and artist talks. Brian O’Doherty. “Inside the White Cube. The Ideology of the Gallery Space”8). Someone aiming to get certain things perceived and discussed as art has an infinite variety of places where to place those things. Tradition would direct him/her to a gallery. We are all used to going to galleries to see art. People passing by recognize them as places in which art is exhibited. Journalists and critics visit them regularly to see what is being exhibited, and granting bodies recognize them as spaces in which art is shown. I would posit that, on the artist side, one of the reasons for the international preeminence of the white cube is financial. Exhibiting in the white cube (theoretically) provides artists with the possibility of producing work while securing their livelihood. Commercial galleries sell artworks, public galleries provide production funding and pay artist fees. However, in Finland, these incentives do not exist. Most galleries (non-commercial, not public) do not sell (in practice if not in theory) and most public institutions do not provide production funding nor pay artist fees. Furthermore, most galleries will take up to several thousands of euros in rent. Given the known problems of the white cube as an exhibition space and the costs associated with exhibiting in it, I find the success of the gallery exhibition surprising. It is interesting that in Kwon’s quote it is normally the institution that takes the initiative. In Finland, where traditionally art is not commissioned by institutions, but submitted to institutions by artists, the reverse of the gallery show is not site-specific or public art (which descends from the publicly commissioned commemorative monument) but making art elsewhere. Elsewhere is by definition not-a-gallery-show but is also by the same token not-public-art–even if it might exist in the public space. Exhibiting elsewhere means that the exhibition’s location is a creative choice by the artist. Instead of working within a framework that has been provided with the commission, and structuring the work around it, the artist looks for an exhibition location in the same way that s/he might choose the other formal qualities of his/her work. Thus, the place where the exhibition takes place creates part of the meanings of the work. Exhibition Elsewhere implies collaborating with the institution or the people that oversee the exhibition location which—inasmuch as collaborating implies also making a space for the other’s desire—will necessarily modify the original project. 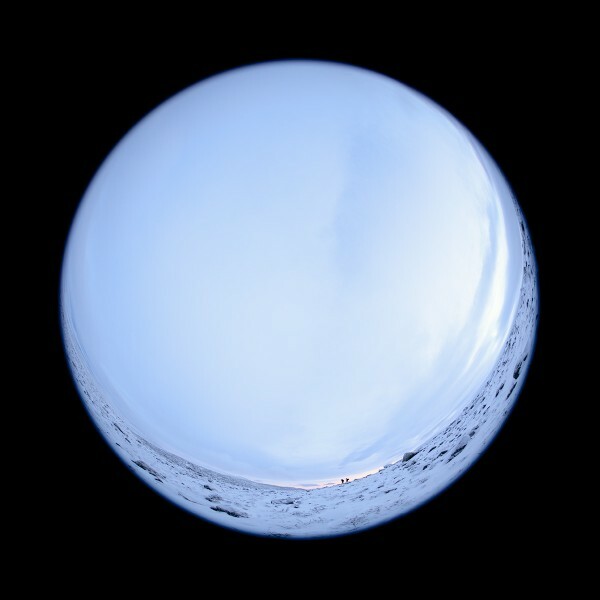 Kilpisjärvellä (2012) is a film planned and shot to be exhibited in planetariums. The word planetarium originally refers to the projector developed by Carl Zeiss in 1923: a self-contained system which was able to project on the hemispheric ceiling of a building the sun, the planets, and the stars, as well as their respective movements. In 1983 the digital planetarium replacement was installed and in the last fifteen years many planetariums were replaced by digital projection systems. While before it was only possible to project astral bodies on the theater’s cupola, the change in projection system meant that it was possible to project onto the ceiling of the building anything that one can feed to the digital projectors. The Buenos Aires planetarium–designed by architect Enrique Jan in the 1960s–has always been a distinctive feature of the city’s landscape. It is located on a park in the middle of the city and as a child I would pass it regularly. 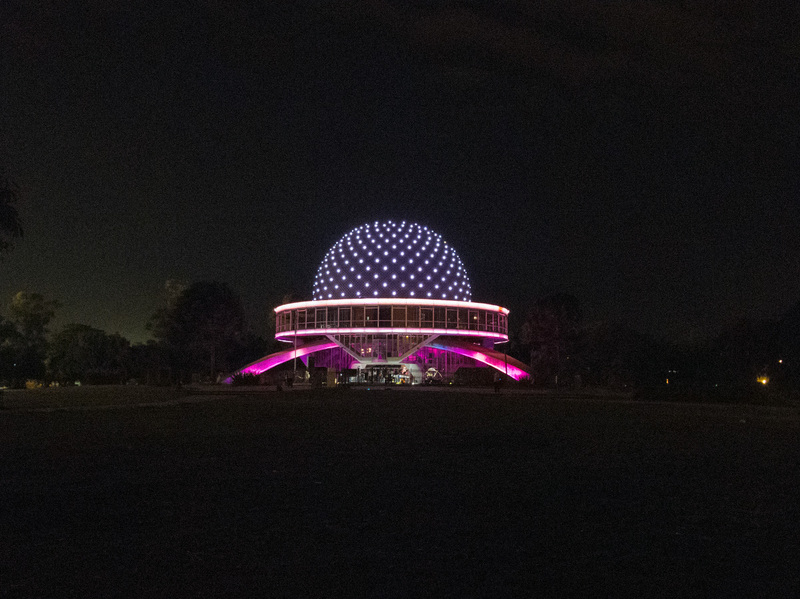 As the photograph that accompanies this text can easily show, walking up to the planetarium through the park at night will already set the spectator in a very particular mood. Walking into the projection theatre and reclining backwards in his/her seat, the spectator will look up to a screen that is all around him/her. It is only then that the film itself begins. Opening Archive (2013) constituted the last installment of a series of works under the same umbrella. Opening (2008), the point of departure, was a catalogue of my work conceived as an artist book. That is, as a work in itself. The book was conceived as a product, as something the spectator had to buy. Being sealed in black plastic, 4kg-heavy and 30 x 20 x 8 cm in size it did not invite a quick peek but contemplation in a quiet place, most likely the spectator’s home. Once home, s/he would then rip off the black plastic, take the book from the box within which it was stored, untie a knot that kept the book closed, and only then open it. Upon being opened for the first time, and in the spirit of the works it was a catalogue of, the book would photograph that instant, develop the image, and store it. With the electromechanical mechanism turning itself off immediately after this, the book became the receptacle for the now useless machine and for its one-off output. Once the production plan for the book edition was clear, it was also clear that the price was quite removed from the originally envisaged bookshop customer and closer to that of the collector. In order to keep the price low and enable the original addressee to acquire the work, an edition of prints was produced. Each A3+ print was sold for €55 with the promised that the cumulative sum from the 15-months of sales would be invested in the production of as many books as possible. After this period was over, the resulting books would be given in a raffle to some of the owners of the prints. The deal was good: for €55 one got a print and maybe a book. In what became a long series of exhibitions and derivative pieces, prints were sold, two books were produced, and they were given away; providing closure to the project. However, one last question remained: How to archive and document a piece which itself was about archival and documentation? After six years working on the project a final exhibition bringing all the disparate elements together for the first time was called for. 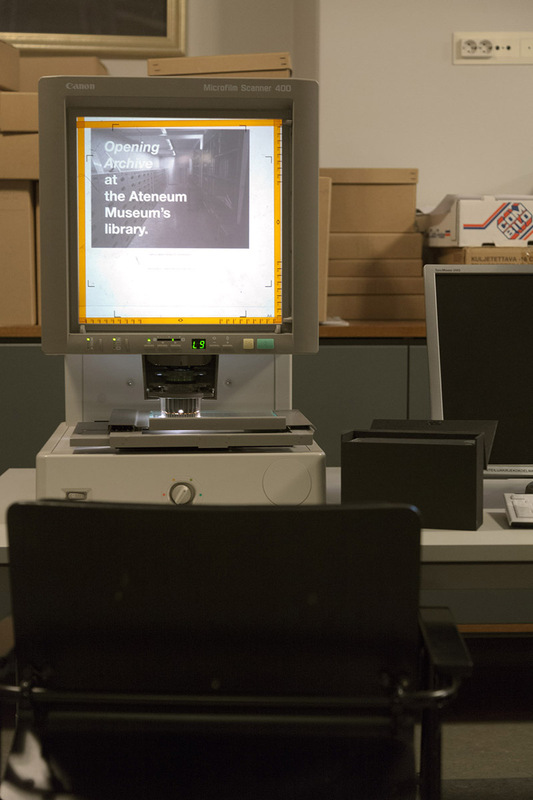 Opening Archive is a permanent installation to Finnish Central Art Archives. A library and archive hosted in the same building as the National Fine Arts Museum, the Central Art Archives hold the history of Finnish art in one space, accessible only by appointment. Exhibition catalogues fill the shelves on the walls. A few microfilm readers are available to browse the extensive newspapers clippings. Professional archivists and art historians silently move from room to room. Located on the shelves, under the S for Straschnoy and next to a catalogue of my work is a small black box. The box holds a text by Pontus Kyander written for the occasion and five microfiches containing the documentation of Opening from the early research to the moment the books were given away. In 1895, Herman Eberhard, a German sheep rancher who had established himself in the area of Last Hope Sound, southern Chile, discovered a strange piece of hide in a cave near his property. A year later, Nils Otto Nordenskjöld, the famous Swedish explorer, saw the hide while visiting the region. Impressed by it, he did some of his own digging in the cave and came up with two extra bits of hide as well as nails and coprolites from the same strange animal, which he later donated to Uppsala University. 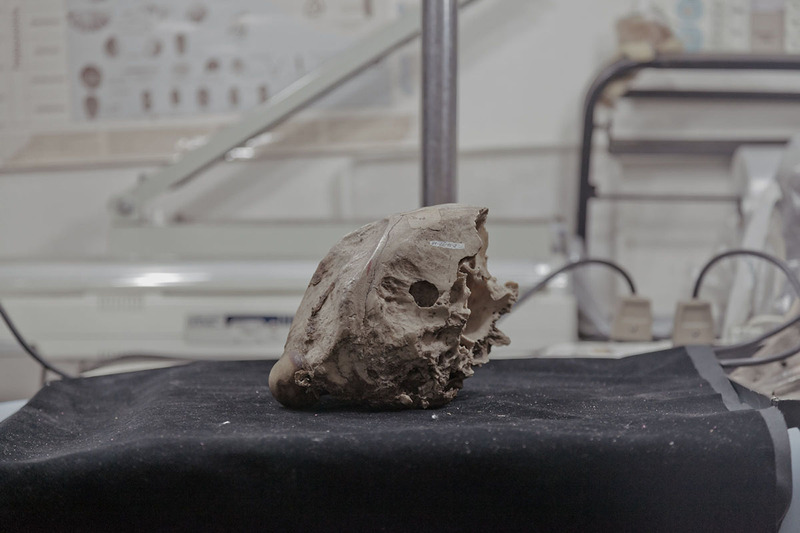 A year later, Francisco P. Moreno, director of the Museum of La Plata, saw the hide and managed to convince Eberhard to let him cut a section of it to take back to his museum. In La Plata this hide was seen by Florentino Ameghino who declared that it belonged to a Neomylodon Listai, a living relative of the Mylodon Darwiini Owen, a 1-ton, 3-meter long ground sloth that had been extinct for 10.000 years. The paleontological world was shocked at this revelation. 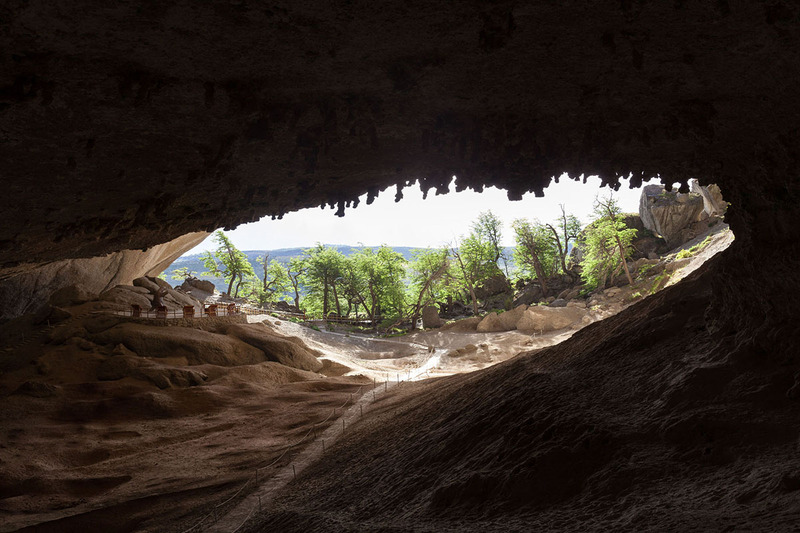 Hunting expeditions were dispatched to Southern Patagonia and digging expeditions to Eberhard cave. The main remains from the cave are today present at the Museum of Evolution in Uppsala, the Museum für Naturkunde in Berlin, the Natural History Museum in London, and the Museum of La Plata while museums in Malmö, Helsinki, Punta Arenas and elsewhere hold smaller caches. The project Neomylodon Listai Ameghino (2015) is a traveling exhibition organized in collaboration with several of these museums. The exhibitions happen within the Natural History Museums, blending themselves among the other exhibits. When funding is not linked to a specific exhibition space – and traditional exhibition spaces can represent a noticeable part of a production budget – the incentive to work in a traditional white cube disappears. A host of venue possibilities are opened up. By working elsewhere an artist is able to sidestep the known problems of the Finnish art system, making work that takes advantage of its qualities instead. It implies negotiations: with a venue which probably has not hosted works before, with its public which is not used to finding visual art in it, and with the visual arts public which is not used to going there to see visual art. It means understanding that the way art is presented is a construction in which artists necessarily participate but which they can also alter.